CDC officers falsified research to fraudulently qualify the LYMErix vaccine. They used high-passage, plasmid-dropping strains (leaving out antigens OspA and B) and knowingly raised the cutoff for the ELISA, leaving out all the neurological cases. This effectively changed the definition of the disease, from relapsing fever Borreliosis to Steere’s Knees, a purely arthritic knee outcome. The sickest people cannot get a diagnosis, and the arthritis cases likely are not looking for one! This is proven by publicly available information from the 1994 Dearborn conference along with a parallel, secret report that illustrates how the research fraud was perpetrated. We want nothing less than USDOJ prosecution of these heinous acts. Be sure to see the links at the bottom and spread the word! Update July 28, 2015: UC Davis researchers confirm–yet again–that Lyme is a disease of immunosuppression and for the CDC to demand that people produce abundant antibodies to have a positive diagnosis is just asinine. Washington, D.C., June 12, 2015: Medical abuse-victims’ rights group Society for the Advancement of Scientific Hermeneutics (SASH) last week completed their planned grassroots protest and outreach efforts in Washington, D.C. 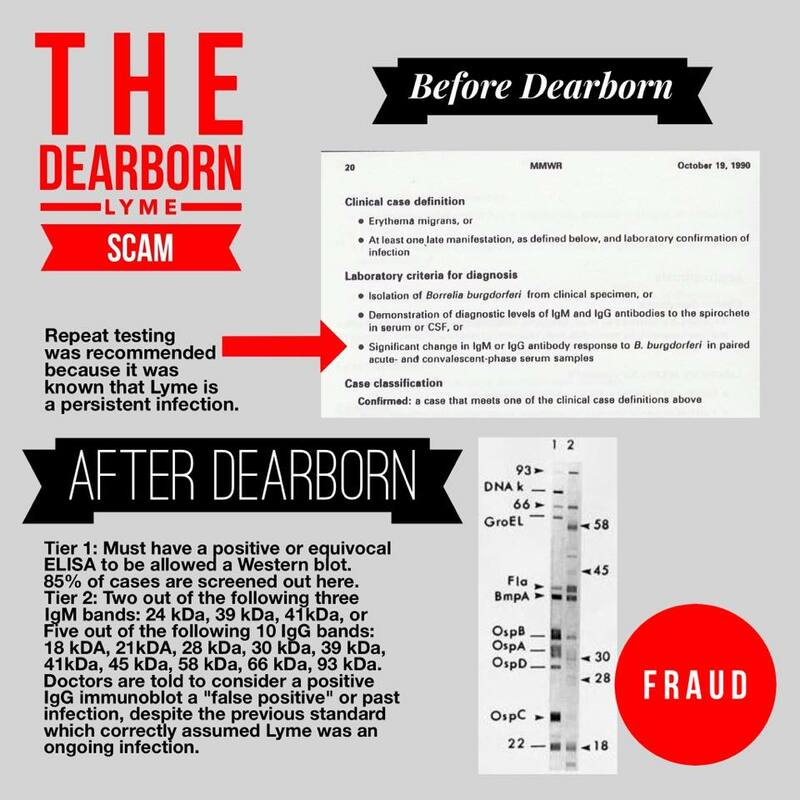 The primary focus of SASH’s June 1-5 efforts was to expose the research fraud committed by CDC officers which led to the falsification of the Lyme disease case definition in Dearborn, Mich., in 1994. The falsified case definition cleared the way for the perpetrators to profit personally from a monopoly on all tick-borne diseases, bogus OspA vaccines and test kits, at the expense of victims who have been unable to obtain proper diagnosis and treatment for the last 20 years. SASH gave Senate and Congressional staff both the public record report of the 1994 Dearborn, FDA Lyme disease conference, and the secret, parallel research report that was withheld from the conference. 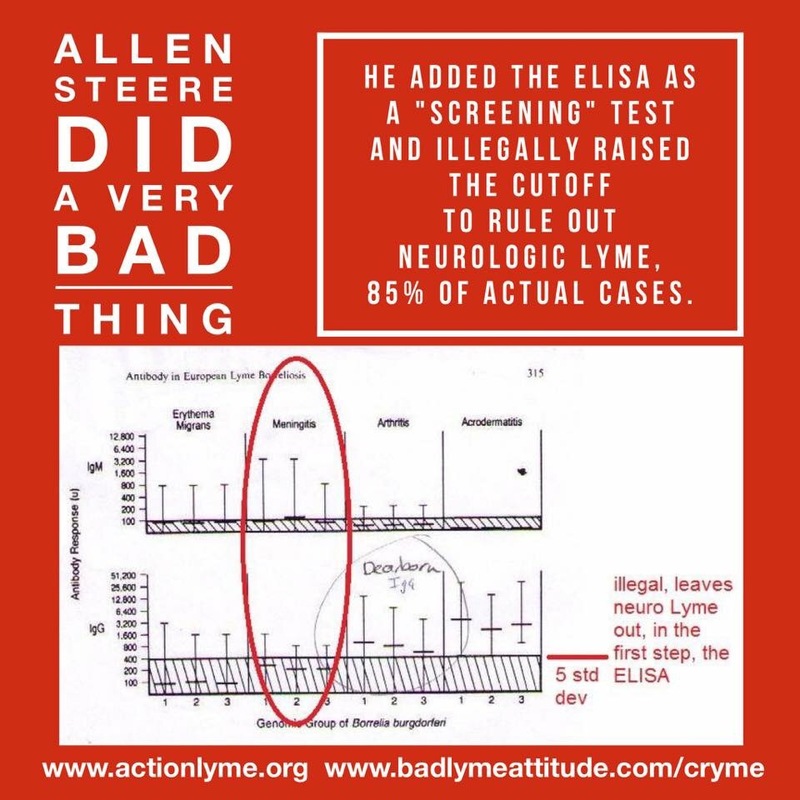 This secret report is the essence of the case, since it shows how CDC officer Allen Steere falsified the Dearborn testing in Europe with high passage strains, recombinant OspA and B without the lipids attached, and raising the cut-off of the ELISA to exclude all neurologic cases. SASH’s leaders say that this is a clear False Claims and Qui Tam case prosecutable by the Department of Justice, and that all pertinent and incriminating information was handed over to legislators from eight different states. In addition to meetings with legislative staff on Capitol Hill, the SASH team visited more than 20 foreign embassies to provide identical information and to relay the message that the U.S. CDC cannot be trusted with the welfare of U.S. citizens, let alone as the worldwide “authority” on human disease. The group also protested in front of the U.S. Department of Justice with the message, “DOJ, do your job!” SASH’s Kathleen Dickson, known as the LYMErix vaccine whistleblower, provided the same information to the Department of Justice in 2003, on the advice of Justice Department staff in the office of Richard Blumenthal, who at the time was Connecticut’s Attorney General. Dickson says the DOJ’s 12-year neglect of her disclosure necessitated the widespread dissemination of SASH’s charge sheets and supporting research reports. SASH is calling on USDOJ to finally prosecute these crimes. Lyme disease, or neuroborreliosis, has left millions of people to suffer in isolation with an AIDS-like illness, while being ridiculed by doctors, family members and employers as psychosomatic or lazy. The victims, often bankrupted by the high cost of out-of-pocket medical expenses, and unable to work due to illness, frequently commit suicide to escape their continuous denial of basic human rights. In 2013 the CDC admitted that actual cases of Lyme disease are under-reported by 10-12 times. Occam’s Razor: If 30 million are sick with fatiguing “syndromes,” the cause must not be very mysterious. Beaux you got this website looking sharp! Excellent work. Thanks! Just added the vaccines page today–check it out! I don’t know why anyone would think Alan Barbour is on the patients’ side. Whoever Bay Area Lyme is, they surely have just fallen off the cabbage truck yesterday. As someone who is simply looking through information for the sake of writing my senator(I’m not expecting a lot), I thought about contacting the organization and letting them know of the discrepancy between the information within his patents and the information he espouses currently. Based on the explanation within the patents I read, he should be a proponent for Lyme patients who live with the reality of persistent infection. On the contrary, he retweets editorials by Auwaerter representing the status quo. To a regular, concerned citizen, it appears as though he is trying to mislead. I’m still learning about what happened with the Lymerix vaccine but the fact that people were hurt by the trial study (deliberately or not) is awful and he should be unemployed as a scientist versus celebrated and recognized. Does anyone know what happened with the study participants? Did some of them remain healthy while others did not? Are they involved and organized? http://www.actionlyme.org One of them is on who owns what patents and so on. I’ve slowly been reading over some of the patents you discuss. What do you think of Alan Barbour’s involvement with the dearborn conference/vaccine development and his subsequent transformation into a patient-friendly lyme expert with ties to Bay Area Lyme Foundation? I’m actually surprised to hear that. I would not trust the guy. The science within his patents contradicts his twitter retweets. In terms of Bay Area Lyme Foundation, I would say that I have been trusting of Lyme disease organizations that appear to be doing something, so was surprised to read about his involvement with vaccine development and to see him listed as a bay area scientist. Yeah, his bio says it all: He’s pretending that there is some magical genetic factor that keeps some people sick, when he knows very well that OspA is immunosuppressive, and the real genetic factor to be concerned with is the HLA linked disease definition that fraudulently excludes those immunosuppressed cases. BALF needs to get educated. If they refuse, then we know whose side they really work for. He looks a little paranoid in that picture. Like he doesn’t trust you and is on edge. So, the DOJ has that as part of the incriminating evidence. Barbour owns the ImmuLyme patent and participated in Dearborn. He trashed us, formally for years. If he is “Lyme friendly” now it is only an attempt to Get Out of Jail, Free. Why we have such trouble getting diagnosed properly! I am convinced this is a bio-weapon intended to send people running to the doctors who then use them as guinea pigs in a wide experiment. A friend told me just yesterday that after his doctor’s visit, a call came from the State health department, unauthorized. He’s in the database now, DNA and everything else. Maybe…but we try to stick with what can be proven. We already take enough BS from the likes (dislikes) of Sweeg. That kind of speculation will only invite more attacks on our sanity. Thanks for checking in, though! Are you THE Winston Smith?